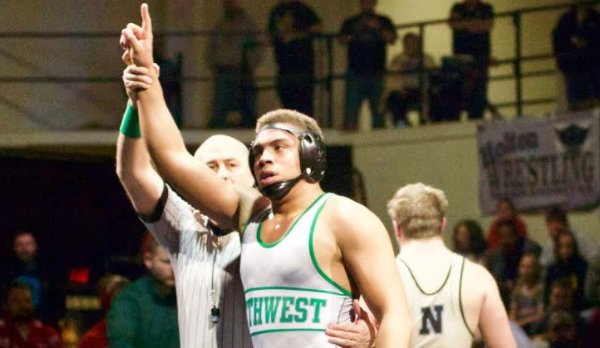 Cordel Duhart, senior wrestler at Blue Valley Southwest High School in south Overland Park, put himself on the map of wrestlers in the state of Kansas last year by capturing the 5A state title with a win over Deveron Duncan of Pittsburg. It was an impressive win for Duhart in the 220-pound class because he was only weighing around 198 pounds as a junior after wrestling at 170 pounds as a sophomore. Duncan, who graduated from Pittsburg last year, was on the other end of things as he weighed 260 pounds entering the season before cutting weight to get to 220 after wrestling in the 285 pound class the year before and placing in the top three. Since last season, Duhart has been one of the top wrestlers in Kansas and will look to defend his 5A state title this weekend in Park City at Hartman Arena just outside of Wichita. He enters this weekend undefeated at a perfect 34-0 on the season and ranked #1 in 5A at 220 lbs. Last year Duhart finished at 45-1. "My goal is to win another state championship this weekend but more importantly to be the best wrestler that I can be and help us try to win a team state title. It felt great to win the individual title last year because of how hard I worked to be in that position and being only 198 pounds." Duhart said. Duhart is still undecided on his future at the next level and will plan on wrestling in college. He's not just a wrestler either he doubles as a pretty good football player for the Timberwolves who saw some on and off success this year in the always loaded EKL. He was a second team all league defensive lineman in the states best league loaded with all-state and division one prospects. Duhart, who is 113-25 in his career with only one loss over the last two years combined, will begin his quest for a second straight state title on Friday in Park City at Hartman Arena as he opens up with a match against Dayton Watkins of Valley Center who is 10-12 on the year. Top challengers for Duhart this weekend could be Cyle Gautschi of Newton, Jacob Quiggie of Maize and Trenton Weilert of Goddard, all ranked within the top four this season in 5A 220 lbs. Blue Valley Southwest We caught out with the oustanding senior wrestler below in the latest Q&A edition of Faces in Kansas. How did you get involved with sports? I got involved with sports when I was in kindergarten. I began to wrestle on and off till around 8th grade and then I started to get serious about sports around that time. I also played football from 8th to my senior year. What are the goals and expectations this season? My personal goal this year is to win another state championship and continue to develop into the best wrestler I can be. Later on in the off season to try and win some national tournaments. My goal for our team is for us to win a team state title this year. What is it like to compete for your coaches at BVSW? It is an absolute honor to compete for the coaches here at BVSW. They push us to be the best we can be on and off the mat. They demand the very best out of us everyday and nothing less. They all are amazing coaches that help all the kids on our team to reach their goals. What style of wrestler are you, what are your strengths and weaknesses? If I had to say what style of wrestler I am I would say very aggressive and consistent, I want to keep coming, put pressure on my opponent and try as score as many points as I can with the time I have. The strengths I posses are my work ethic; I try to work the hardest I can in every aspect of wrestling. My drive, I want to be the best wrestler I can and I’ll do anything to achieve it. Some weaknesses I posses are getting frustrated easily when I can understand a new move or technique and being to hard on myself for little errors. What was the state title experience like last year and how much pressure does that bring this year? Winning the title last year was amazing, it was an awesome experience for me I was only about 198lbs and the other wrestler was close to 225-230lbs, so it was a little tough but it felt great to have worked for the win. It put some pressure on me for this year but not bad pressure more of motivation to work towards another one. I like being “the Guy” that people want to beat. Plans at the next level for College? I’m undecided on where I will be going yet, but I do plan on wrestling in college. Other key wrestlers your team this year? Our room is full of key guys but the starting line-up we have is solid top to bottom. All 14 guys are state qualifiers and can score points at the state tournament, which is a pretty amazing thing which is why I think they are all key wrestlers. Best wrestler you’ve went against and other key players you’ll face this season? The closest match I’ve had this year was with a wrestler from Chanute, Kansas he was a natural athlete and very dynamic. The final score of our match was 4-3. I also beat a state finalist from Iowa in the finals of the Council Bluffs Tournament to start the season. Some key people I will see this season will be the 220lbs from Maize, Turner, and other parts of Kansas. How was football this year? What’s it like to grow up in KC area and go to your school? Its pretty unique we have a lot of opportunities to further our educational and athletic careers. The facilities we have are exceptionally nice, all academic help and facilities are excellent. My favorite subject in school is either science or math. I see myself graduated from College, possibly still in Medical School. I’m interested in studying to be a Neurologist, Chiropractor or Veterinarian. Best place to eat in your surrounding area? The best place to eat in my area would be: Fortune Wok, Kansas City Joe’s, and Jose Peppers.